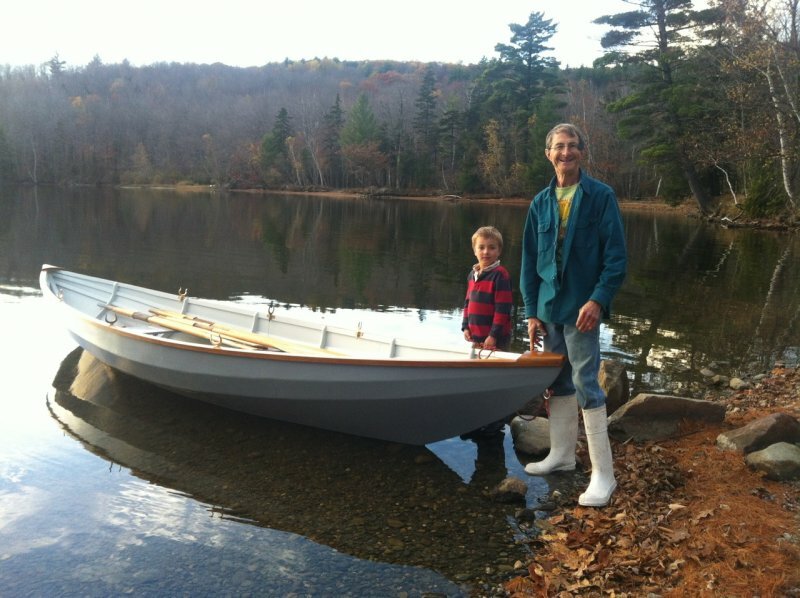 Looking for a boat which I might build to incorporate 3 fixed seat rowing stations, I found the Chamberlain Gunning Dory in “Gardner’s Small Boats.” By good fortune I mentioned this to a physician friend only to learn that he had inherited a partially built Gunning Dory from another physician who had started the project by setting up the frames, stem, stern and floor boards. My friend laid the gar-board planks and then abandoned the project. I eagerly took it on, and over the course of a number (too many) of years finished it, launching it on my birthday in October 2013 — see picture of me and my grandson at the launching. I was very pleased with it’s handling and look forward to some salt water rowing in 2014.